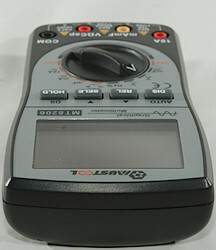 This is a DMM that can also show waveforms. I got the meter in a cardboard box with specifications on it. 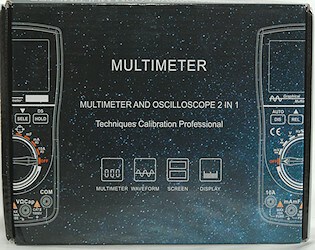 It included the DMM, a pair of probes, a bag and a manual. The probes are without tip covers, i.e. they are only CAT II rated. 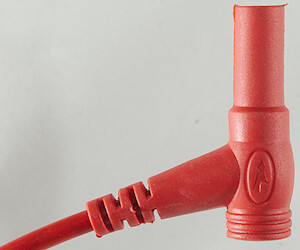 The plug is fully shrouded, but is slightly smaller than standard probe plug size. Both meter and tilting bale is smooth, this makes it difficult to use the meter one handed. The bag can fit both meter and probes, but feels a bit tight when doing it (Meter fits easily in it). 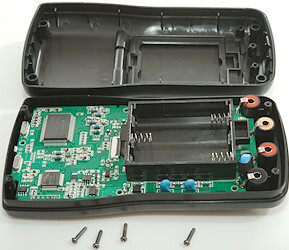 Battery lid uses do not use a screw, is clipped on and has instruction on how to insert batteries (Centre battery last). The power on screen shows four lines. The screen always uses background light, this gives it a good contrast. The display will usual show the value and unit, together with a bargraph. 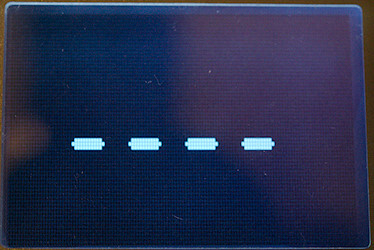 The display is a graphic display, this gives some flexibility with showing symbols and units. The display have a log of saved values. And it can show waveforms. DIS/Auto: Manual range, hold down to reactivate auto range. 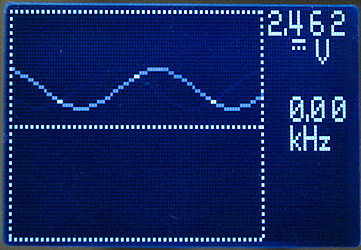 When held down in auto range the waveform display will be shown. REL: Remember current value and show values relative to this, this function is indicated with a triangle on the display. SELE: Change between ohm, diode, continuity and capacity in ohm mode and DC, AC in current modes. HOLD/DS: Freeze the display value and store a value/chart, press again to release. Hold down this key to enter the log. 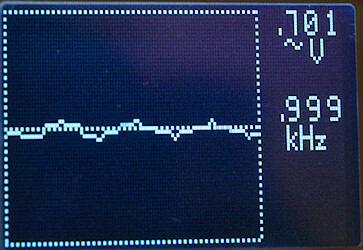 : Use for page up/down when showing recorded data and for adjusting time in waveform display. 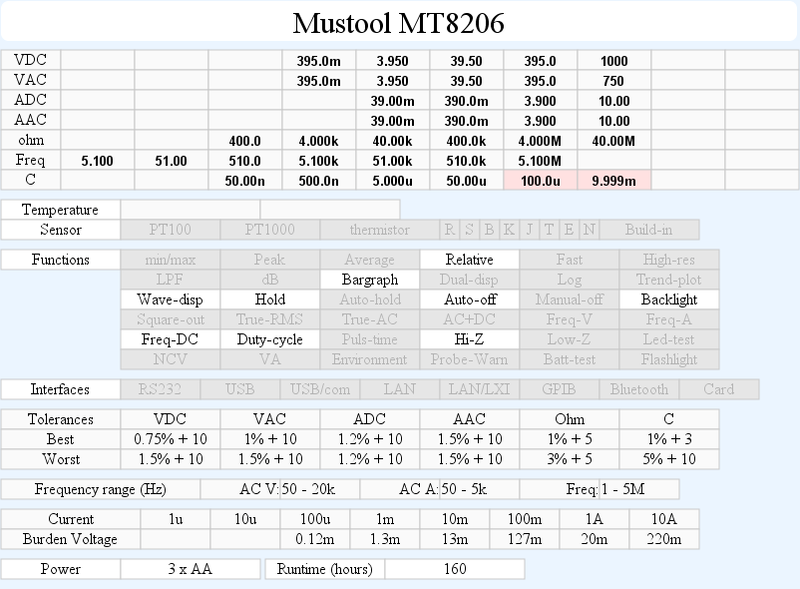 VAC: AC volt and mV range, mV must be selected manually. Hz%: Frequency and duty cycle. 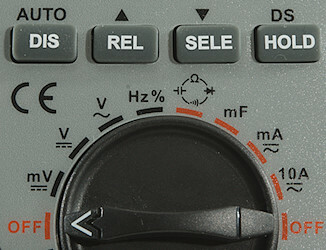 If you have multiple meters, be aware that this meter has placed the minus connection different than other meters. 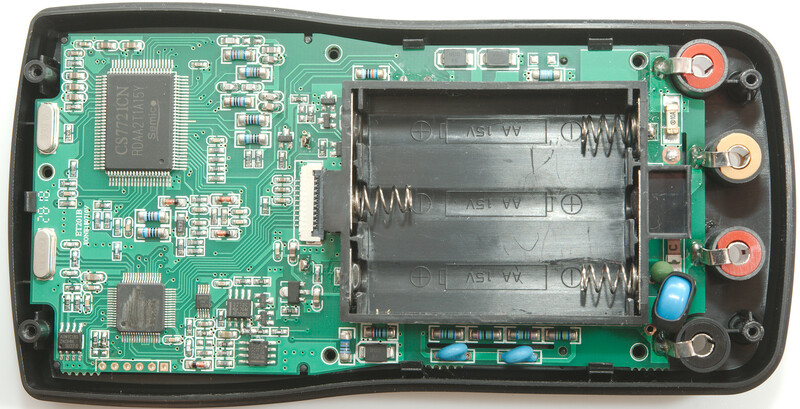 CON: The common terminal for most ranges, large capacitor is excluded from this. The lines marked 00, 01, 02, etc. are the log entries, there is space for 100 entries. The value below is the current input value. Hold down HOLD to change into this mode. To exit hold down HOLD, using the rotary switch will also exit this mode. Using to go a page up/down. 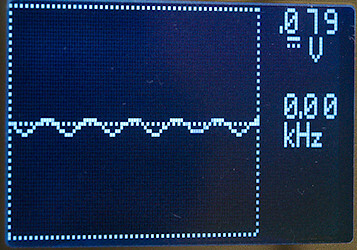 I will not call this function a oscilloscope function, but a waveform display function, it do not support enough functionality for a oscilloscope. Hold down DIS to change into this mode. To exit hold down DIS, using the rotary switch will also exit this mode. Pressing or will change the timing, i.e. show more or less of the curve. 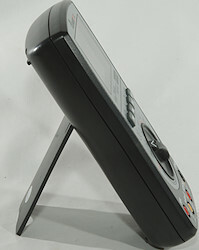 The HOLD button can be used to store 10 waveforms, it works similar to the log function above. 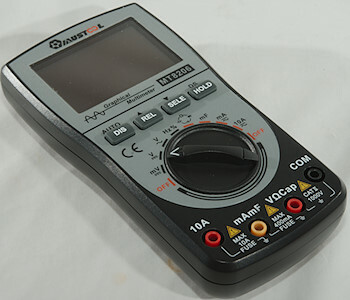 The display can be activated in mVDC, VDC, VAC, mA and A, but in DC modes there is a low pass filter. The curve above is the same curve as the first one, but this time I used VDC instead of VAC. 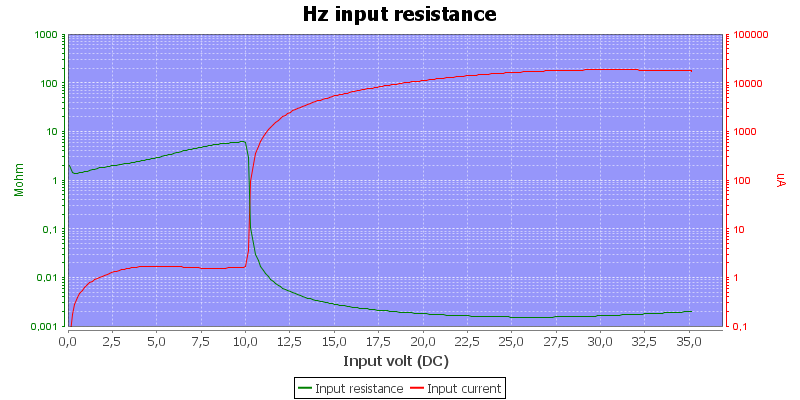 10Hz 5Vpp with 2.5V offset, this means the curve must just touch the centre line, but due to the low pass filter the AC is reduced in amplitude. 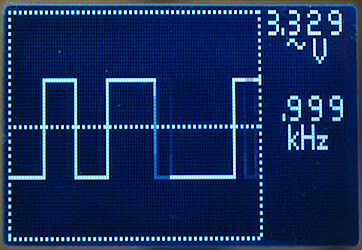 A 1kHz square wave, sometimes it is shown fine and sometimes it looks like this. 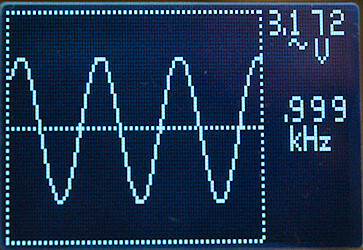 A 10kHz square wave is completely hopeless. The same is a 10kHz sinus wave. 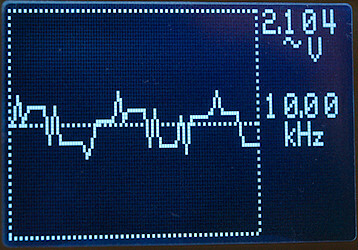 A 1kHz sinus at lower amplitude is also a problem, the waveform display do only have the voltmeter ranges, nothing in between, that is not good enough. There is audible alarm on overload on any voltage range. There is audible alarm on overload on current ranges, except 10A range! Continuity is moderate in speed (About 120ms). 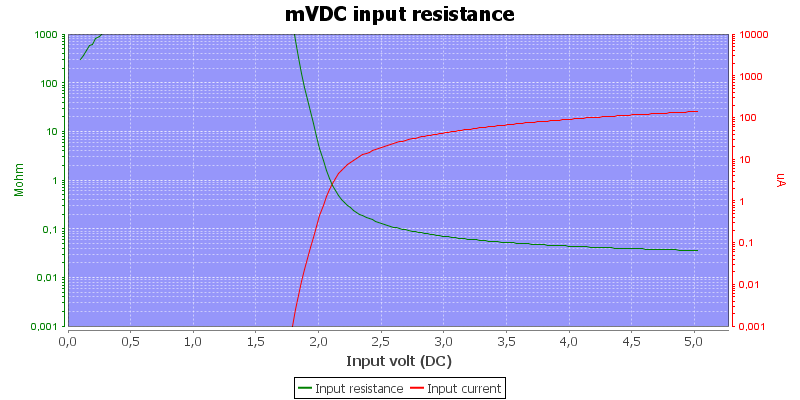 Continuity beeps when resistance is below 100ohm . 10uF takes about 3.4 seconds to measure. 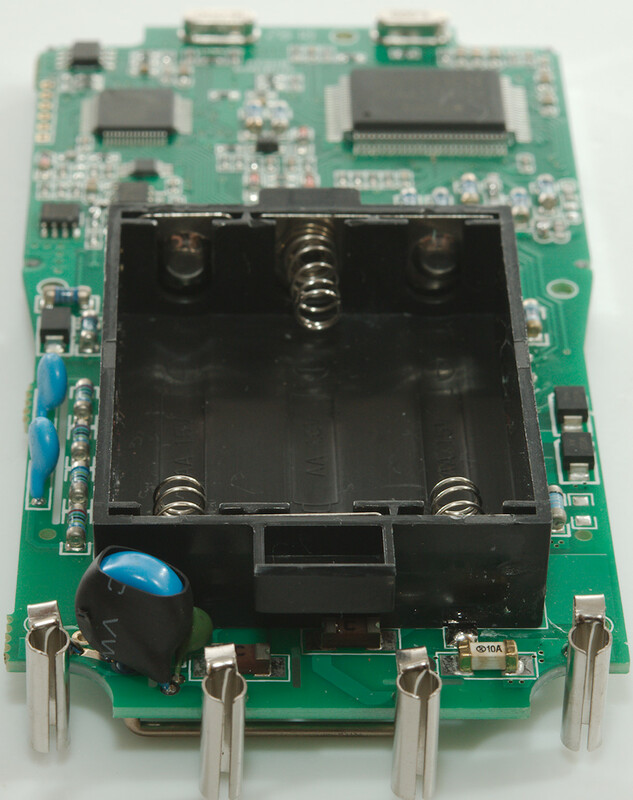 mF is protected by a PTC and a TVS diode. 100uF takes about 18 seconds to measure in low capacity selection. 100uF takes about 4 seconds to measure in high capacity selection. 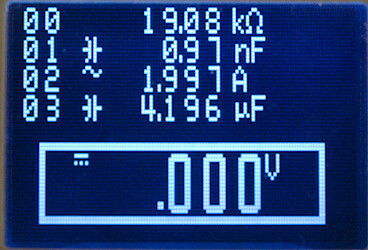 11000uF takes about 18 seconds to measure in high capacity selection (Display shows about 9.200mF). 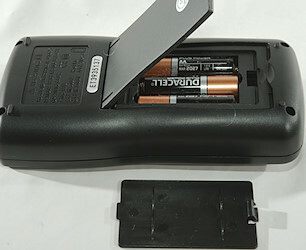 Measuring large capacity values flashes empty battery symbol sometimes. 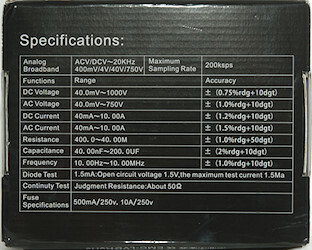 Ohm and capacity input is rated for 250VDC/AC overload. Display is too dark to read at 2.6V, battery symbol show at 2.9V. 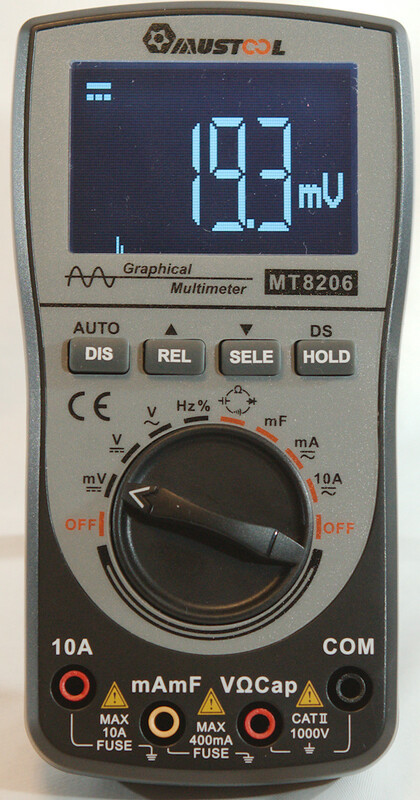 Meter reading is stable while display is readable. 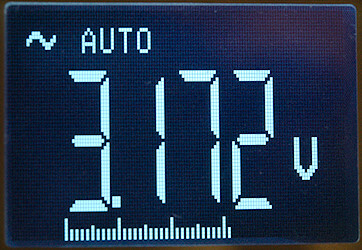 The meter will usual show the correct value after two display updates and a update for each range step. Bargraph updates at same speed as display. Will automatic turn power off in about 15 minutes. 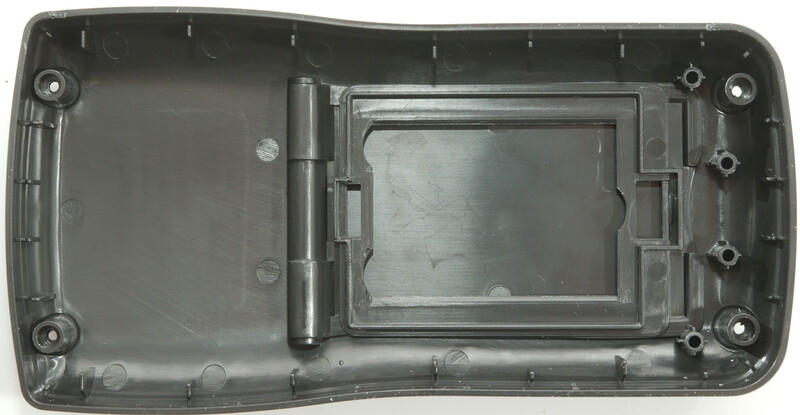 Weight is 256g without accessories, but with batteries. 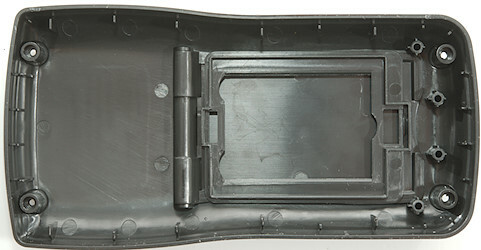 Size is 160 × 82.5 × 37mm. Probe resistance 92mOhm for one. Probe wire is soft and 82cm long. 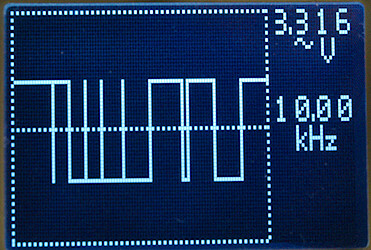 A look at the capacitance measurement waveform for a 1uF capacitor. 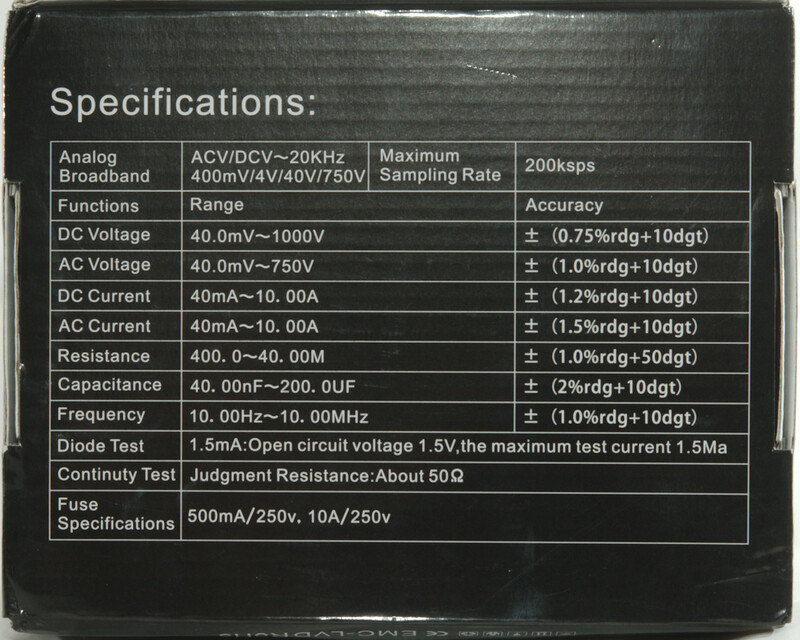 The mF range uses a much higher test current and 100uF is a very low value here. A 10mF capacitor is maximum that can be measured, but due to errors I could use a larger one for testing. 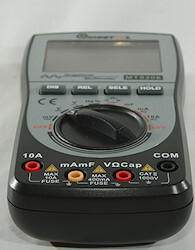 The mV range has high input impedance, except when voltage goes too high. The maximum value in each range varies slightly. 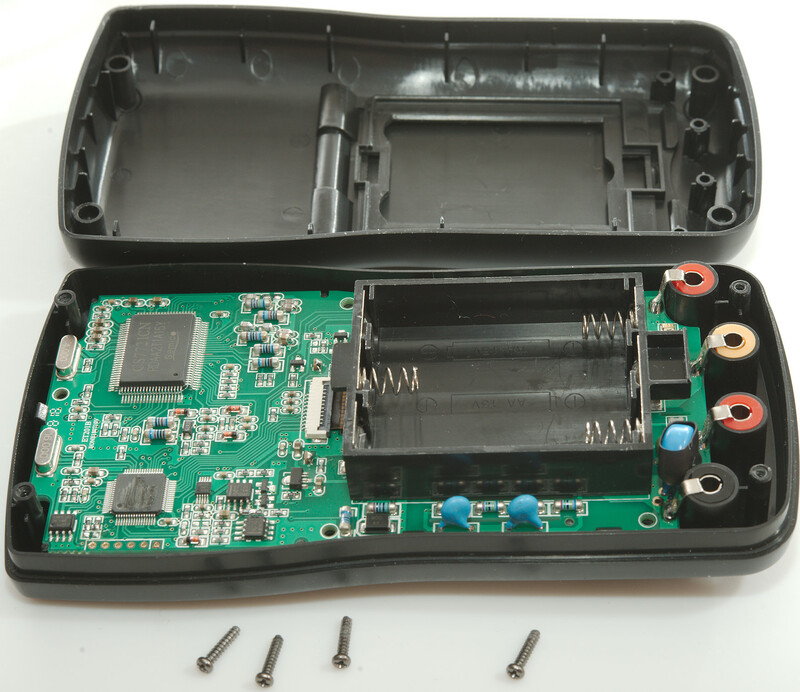 I had to remove four screws before I could open the multimeter. 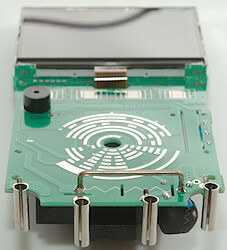 The battery cassette is mounted directly on the circuit board. 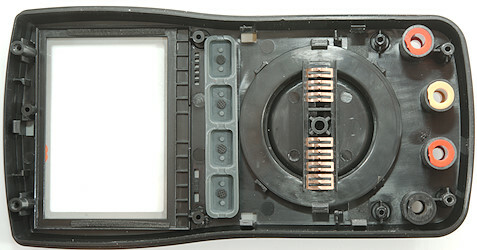 The circuit board is mounted with five clips, no screws are used, but there is space for five screws. 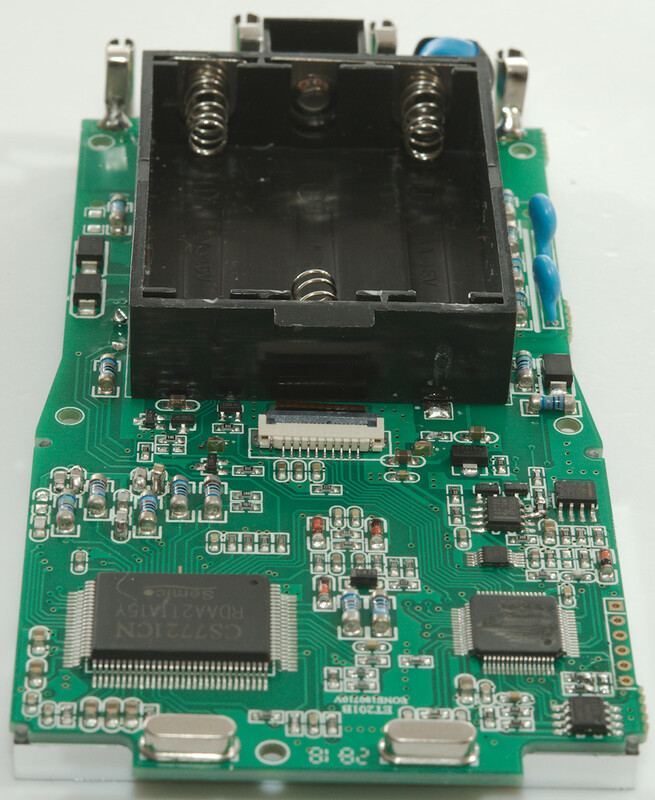 The 10A current uses a SMD fuse and the usual wire shunt, the mA range is a 1ohm resistor with a TVS diode across. 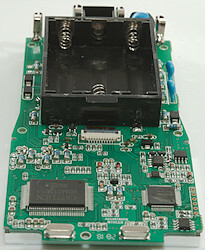 The other TVS diode is used for the mF range. The voltage input has a MOV directly to minus input and uses four resistors (4×2.5Mohm) and two capacitors in series (2×10pF 3kV). 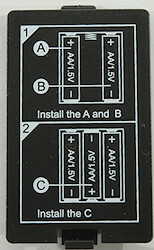 The mV range uses a PTC and a transistor pair (Next to 2 × 8pin chips) as protection. For the ohms and low capacity range the same PTC is used, but another transistor pair. The two 8 pin chips are dual OpAmps(TLC2272) and the smaller 10 pin IC is dual analog switches (SGM3005). 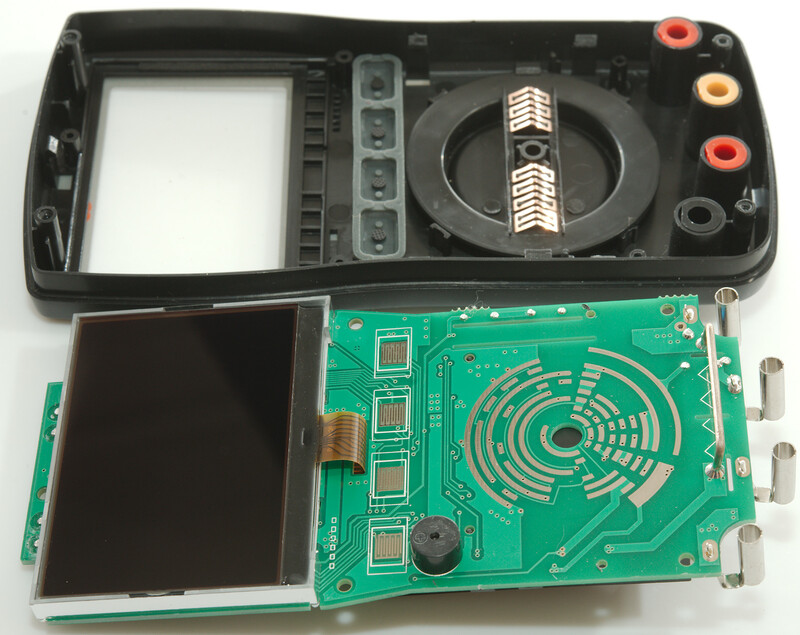 The large IC (CS7721CN) is a multimeter chip and microprocessor in one. 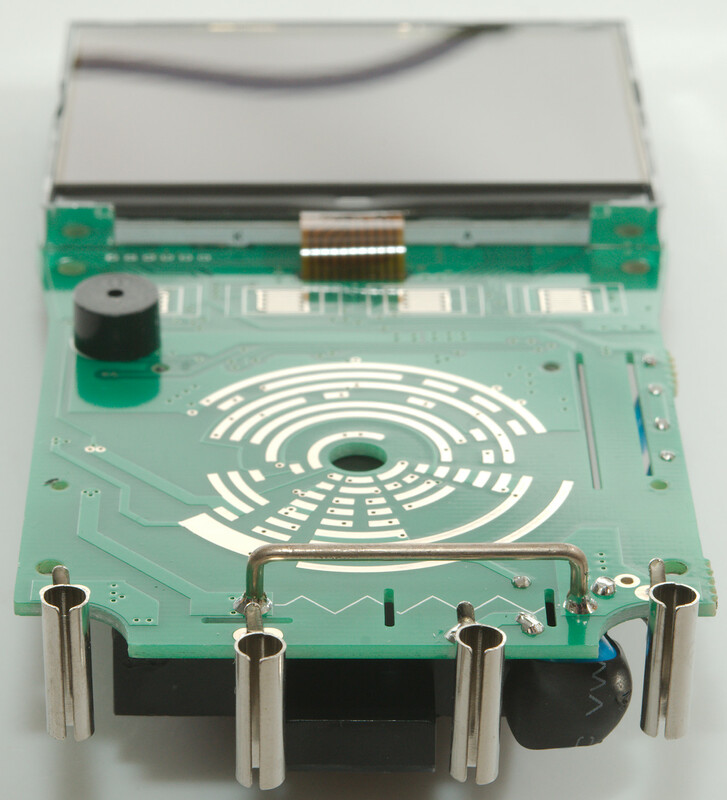 The number is scraped of the second largest chip, but it has communication with the display and is connected to a EEPROM (24C64). On this side of the circuit board is the 10A shunt, a nice big one, the buzzer is here. Then there is pads for the buttons and the rotary switch. The display is mounted here with the backlight soldered to the circuit board and the data in a flat flex cable that is connected on the other side. As usual the CAT rating is wrong, a 250V fuse is not acceptable on a 1000V meter, but will work fine for hobby work. A MOV directly across the input is not the best idea around, it will handle small stuff, but exploded if any serious stuff hits it. 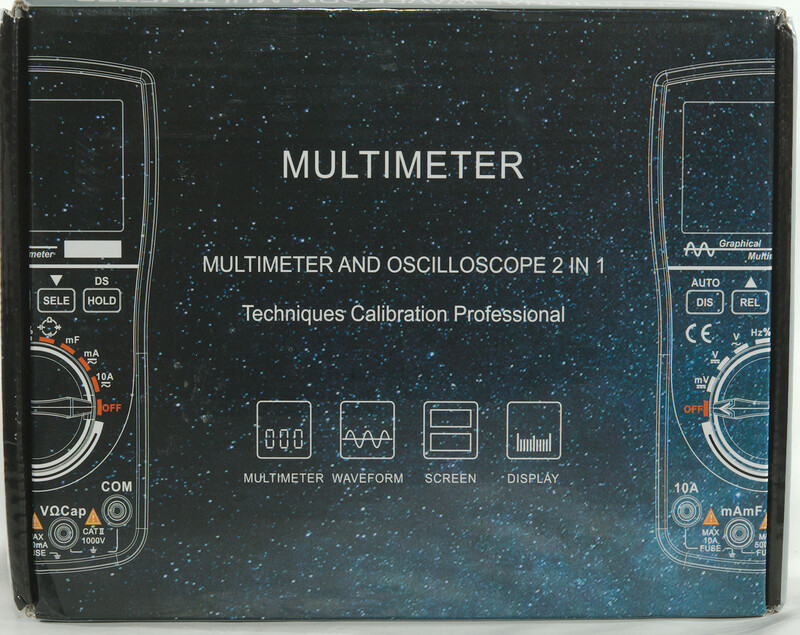 As a meter it is decent, it has a fair selection of ranges and the backlight display is easy to read with good indication of selected function. The mains extra on this meter is the waveform display and that is a disappointment, it only works with low frequencies and the DC input is filtered way too much. 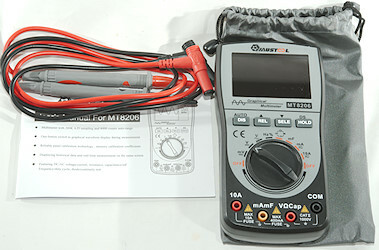 The multimeter was supplied by banggood.com for review (I believe that Mustool is a Banggood brand). Thank you HJK. Regretting purchasing one of these now, but it's good to know it's capabilities/limitations. The waveform displays made me laugh.